A woman voting at a polling station in Gao, north of Mali, during the run-off presidential elections elections between outgoing President Ibrahim Boubacar Keita and opposition leader Soumaila Cissé. 12 August 2018. Following the conclusion of the second round of presidential elections in Mali, political leaders in the West African country are being encouraged by the UN Secretary-General to promote a peaceful atmosphere and avoid incendiary rhetoric. António Guterres’s request came in a statement congratulating the people and Government for the vote, which was held on Sunday. Malians initially went to the polls in late July to choose a new leader. Incumbent Ibrahim Boubacar Keita, who is seeking a second term, faced more than 20 opponents, including main opposition leader, Soumaila Cisse. The run-off election was called as none of the candidates secured the required 50 per cent of votes. The final results are not expected for a few days. The UN chief welcomed measures that allowed voting to occur safely in most of the vast country, amid difficult weather and security challenges in some areas. “The Secretary-General appeals to all parties to remain calm through the conclusion of the electoral process, and to continue to address any grievances in accordance with the laws and constitution of Mali,” according to the statement, which was issued on Monday evening by his Spokesman. 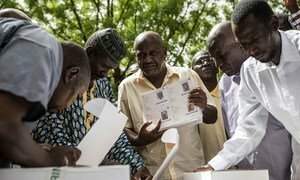 On the eve of Mali’s crucial presidential election, the United Nations Secretary-General said that despite clear security challenges, voters in the arid African nation of around 18 million, needed to ensure that the key poll was first and foremost “an important celebration of democracy”.